More features than you'll know what to do with! Travel-Ready Construction - Heavy-duty buckles , handles and zippers make for long lasting use in any condition. The high-quality nylon and fabric construction is reinforced with thick padding to always protects your device. Padded shoulder straps and back also provide comfort and allow air to flow. Custom Compartment Configuration - Large front zipper opening provides access to your camera , lenses and more. 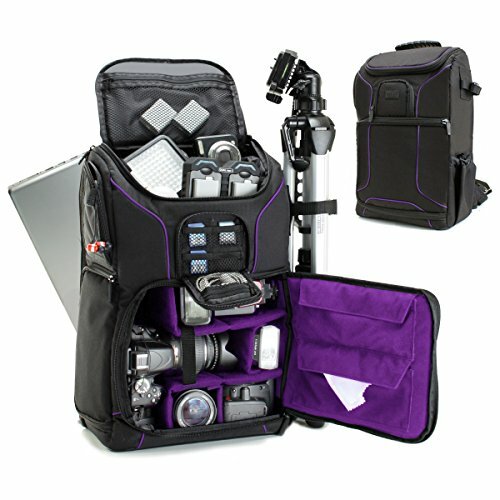 Velcro divider walls lets you customize the camera compartment and accommodate your equipment however you prefer. Two quick-access side doors allow you to grab your camera and lenses quickly , so you don't miss a shot. Wear as a Backpack or Sling - Tuck-away shoulder straps allow you to wear the bag on one or both shoulders! You can also wear across your chest as a sling. Stow away unnecessary straps into the luggage handle slot. Waist strap included for weight management and comfort. Additional Features - -Padded compartment (16.5"L x 10.5"W) for up to 15.6" laptops - -Large upper padded compartment for carrying bigger gear and accessories - -5 net accessory pockets for memory cards , cables , chargers , lights and much more! - -Tripod holding system with strap and foot holder - -Custom fit rain cover for unexpected storms and splashes - -Luggage handle slot for easy transportation on top of rolling bags and cases. Works With: Nikon 1 AW1 , 1 J1 , 1 J2 , 1 J3 , 1 J4 , 1 J5 , 1 S1 , 1 S2 , 1 V1 , 1 V2 , 1 V3 , D200 , D2Hs , D2X , D2Xs , D3 , D300 , D3000 , D300S , D3100 , D3200 , D3300 , D3400 , D3S , D3X , D4 , D40 , D40X , D4S , D5 , D50 , D500 , D5000 , D5100 , D5200 , D5300 , D5500 , D60 , D600 , D610 , D70 , D700 , D7000 , D70s , D7100 , D7200 , D750 , D80 , D800 , D800E , D810 , D810A , D90 , Df And More! THE PERFECT AMOUNT OF SPACE FOR YOUR GEAR - Ditch the boxy, bulky packs. The S17 offers the perfect amount of storage room for serious photographers without an oversized form factor. COMPLETELY CUSTOMIZABLE INTERIOR - Adjust the interior to perfectly fit your gear, the padded dividers can be added/removed/organized based on your needs. Internal Dimensions of 11" x 10.5" x 6"